Slow growing, evergreen shrub, easy to manage for smaller gardens too. 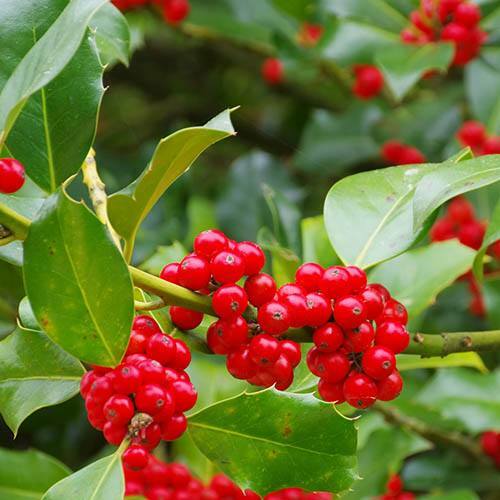 If you want holly berries guaranteed for your Christmas decorations grown at home in your own garden then the classic variety 'JC van Tol' is the best variety to grow as it is entriely self-fertile. Typically hollies have male and female plants, the females producing the berries once their spring flowers have been pollinated. This variety has both flower types on the same tree, so guarantees berry crops. Nothing beats the iconic sight of spiky evergreen leaves and red berries, and with this easy-care evergreen shrub, you will have year round interest too. Can be grown in pots as it is slow growing and very hardy - make space in your garden for some holly!